« Are “the meritorious” a protected class? Explanations range from inherited DNA to family resources (for better schools and test prep) and parental study help – either help with the material or motivation & discipline. Note that the latter – motivation & discipline – doesn’t require a high level of education attainment … it just needs parents who value education – whether they have it or not. Both parents suffered through and survived the Depression. I attended a well-intended but very mediocre public high school. 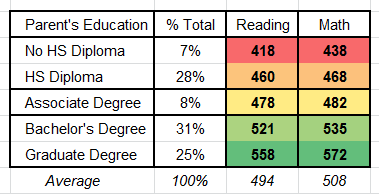 Less than half of the 500+ sstudents in my graduating class went to college. More graduates went to jail than to “elite” coleges. We weren’t assigned many books and wrote very few essays. The most advanced math course was pre-calculus. No A, B or C level calculus. 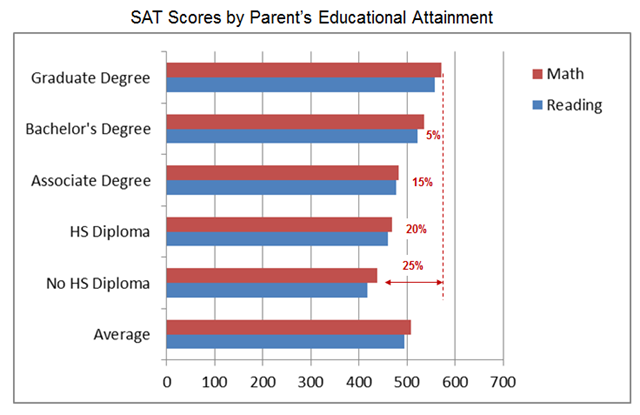 Despite all of that, defying the above chart., my math SAT was over 750 … and, my verbal score was above the median of today’s kids whose parents have graduate degrees. In those days, that was just good enough to get a blue-collar kid from Cleveland into Princeton. Credit my parents who didn’t need to be educated to be smart … who valued education enough to make it a family priority… and who set the bar high. Morale of the story: Strong parenting works … it’s morally better than cheating … and way cheaper than bribing. This entry was posted on March 20, 2019 at 6:59 am and is filed under Uncategorized. You can follow any responses to this entry through the RSS 2.0 feed. You can leave a response, or trackback from your own site.